The Clare, a luxury retirement community on Chicago’s Gold Coast, tasked Solutions Advisors in the second quarter of 2014 to provide an assessment of their digital marking efforts. This assessment quickly uncovered many unseized opportunities for The Clare and Solutions Advisors was soon contracted to turn around an underperforming campaign. Solutions Advisors’ strategy for optimizing The Clare’s digital campaign encompassed all aspects of search engine marketing tactics and functionality including technical improvements, content creation, establishment of engaging calls-to-action, keyword research, relaunch of new pay-per-click advertising and site navigation enhancements. 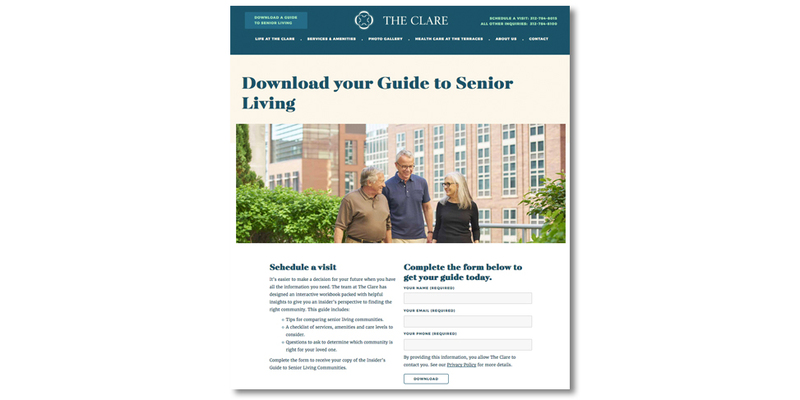 The primary goals were to make The Clare more visible online to its’ target demographic, improve the user experience and ultimately create more conversions (lead inquiries). In two quarters prior to Solutions Advisors’ management of The Clare’s search engine marketing campaign, monthly lead generation fluctuated between 18 and 40 per month. In only the first month of campaign management with Solutions Advisors, The Clare’s website generated 59 lead inquiries. Through the second quarter of 2017, The Clare has received a monthly average of 214 lead inquiries through digital marketing efforts. Today, The Clare continues to see improvement in its search engine rankings, increases in traffic from highly-engaged prospects and gains in qualified lead inquiries. While more enhanced practices such as long-content blogging and multi-tiered landing page implementation have been layered into the digital marketing campaign, the primary focus continues to be improvement of The Clare’s online visibility and enhancing the visitor’s experience.